Yet another, crock pot soup! It’s so cold, nothing goes better with cold than soup. I dare you to challenge me on that! Dinner is getting kind of hectic these days, we need quick, easy and warm preferably. Matt’s favorite food is lasagna and so we like to do a twist on that! Enjoy this because I know we did! 1. First mix together the bottle of marinara and tomato paste in the crockpot. 2. In a pan brown the beef with the garlic and onions in a pan. 3. Next add broth, beef mixture, parsley, basil and salt and pepper. 4. Cover and cook on low for 7 to 8 hours. On high for 4 to 5 hours. 5. When there is 30 minutes left of cook time, add in the 1 cup of water and noodles. Stir to combine. Put the lid back on and continue cooking for 30 minutes. 6. Top with shredded cheese and enjoy!! 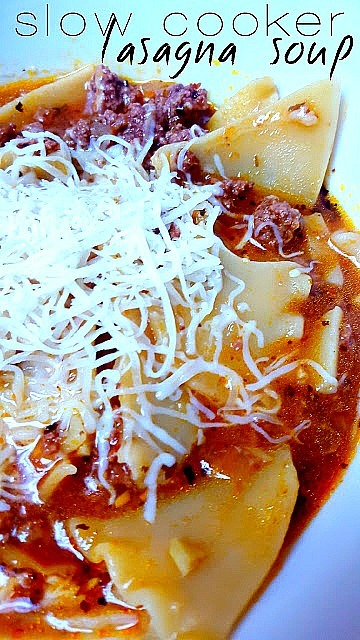 This slow cooker lasagna soup looks amazing. Thanks for showing us how to make it. What a great recipe! Hope you are having a great day and thanks so much for sharing with Full Plate Thursday. This looks so good, have to try soon!! I love my soow cooker! This is great. Thank you for sharing at #overthemoon. Pinned and shared. I'm going to have to try this! Thanks for sharing on our Tuesday Tips and Tricks party! I never prepared lasagna soup before. This looks so yummy and delicious and so easy to prepare. Someone makes the most delicious looking comfort food!! Thanks for stopping by to share on #OMHGWW this week!! Pinned to share, Tweeted too! What a deliciously easy way to get the taste of lasagna without all the hard work! 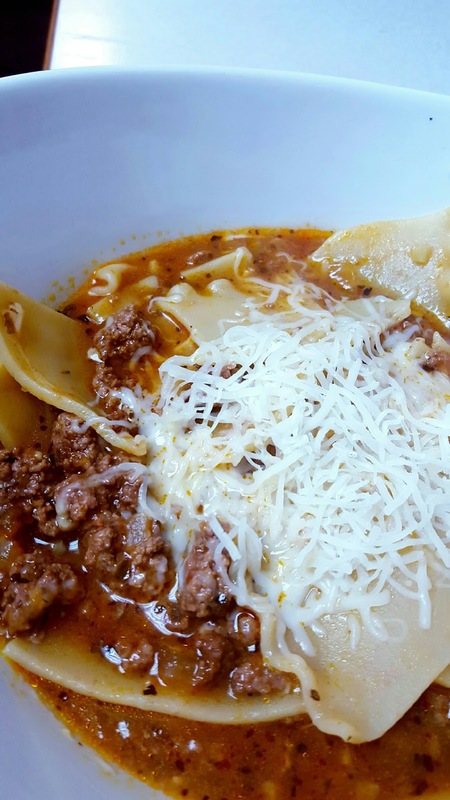 Your Slow Cooker Lasagna Soup looks so comforting and tasty. Sharing. Thank you for being a part of our Hearth and Soul Hop. Hope to see you again this week!